A surprise delivery of these assorted Nouvelle mushrooms arrived late on a Friday, accompanied by a Creation Pinot Noir wine. Both grown and created in the lovely Hemel en Aarde Valley near Hermanus, fungus and grape are equally associated primarily with earthiness, softly decomposing vegetation, and single-minded clarity in terms of flavours. 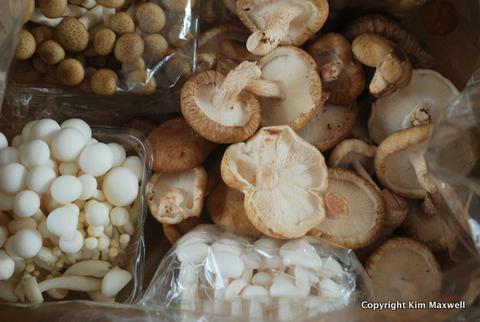 My selection included fat shitake with its thick brown cap, and more delicately flavoured white and brown shimeji, sold as a mass attached by their narrow stems. What to cook alongside these delicious fungi? Plans were shuffled and wine-and-mushroom-loving friends hastily assembled for Sunday lunch. The main ingredient for the menu was obvious, and with a FIFA World Cup final planned that evening it meant only one thing: a Germany versus Argentina theme for the additional wine and food elements. This was quality stuff; a tablecloth was in order. Cut 1 roll of butter puff pastry into rectangles, scoring a smaller rectangle near the edges to prevent the middle puffing up. On a baking sheet, bake at 200 degrees C for 15 to 20 minutes until golden. Sauté 2 small, finely chopped onions in olive oil. Add a sprinkling of brown sugar to caramelise the onions slightly. Gently sauté about 500g of thickly sliced shitake mushrooms in enough salted butter to coat, plus chopped garlic, until golden and tender (I fancied the bigger, fatter mushrooms varieties for the tarts). With the mushrooms removed and the pan juices remaining, add about 100ml cream, salt and black pepper, and a sprig of lemon thyme. Gently reduce that for about 8 minutes to thicken, then cool in the pan. Assemble the mushroom tarts when everybody is ready to eat. 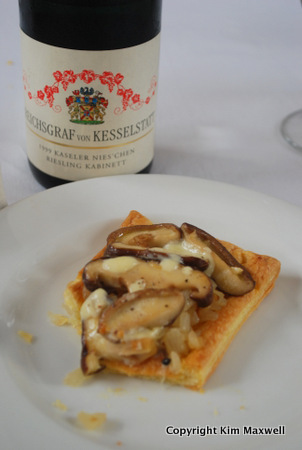 Spread cooled chopped onion over the cooked pastry, then top with slices of buttery mushrooms. Spoon over cooled, reduced cream, then pop into a hot oven for about three minutes at 220 degrees C.
To drink? The wine of the day. Buttery pastry and rich cream sent me towards a wooded white, but woodsy mushrooms tend towards leaner Pinot Grigio or unwooded Chardonnay. So I thought I’d give a German Riesling a go. I had one stuck away just waiting for the perfect day … What joy that it lived up to the occasion. Reichsgraf von Kesselstatt Riesling Kabinett 1999 from a tiny Kaseler Nies’Chen vineyard in the Mosel Saar Ruwer region, was off-dry but luscious, lemony and light in that ethereal way only German Riesling gets right. Only 8.5% alcohol. We all lapped it up. Perfectly pitched with the tart. Cooking for Sunday lunch is chaotic in our house, thanks to a young son who easily gets into mischief and a husband whose job demands desk hours every Sunday morning. 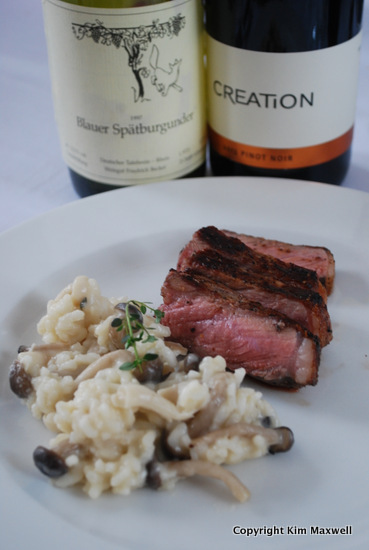 It’s also not smart timekeeping to start assembling a mushroom risotto only when a friend arrives with his homemade chicken stock, and simultaneously get the Weber coals just right for searing aged olive-oil-basted sirloin to medium-rare perfection. With a few sips of wine and some patience we managed. Gently sauté 2 tubs of Shimeji mushrooms (1 white and 1 brown), ends of stems removed, in about 20g of salted butter for a few minutes until tender. Remove the mushrooms. Melt about 80g of salted butter, covering the base of the pot. Add 2 cups of arborio rice, stirring to coat them in butter with a wooden spoon for a few minutes, at low heat. Return the shimeji mushrooms to the pot for a few minutes, and as soon as they’re warm, start ladling in about 6 cups of homemade chicken stock, letting each ladle be absorbed before adding more liquid. It takes about 40 minutes, and the rice will soften near the end of the cooking time. Just before serving, add 1 cup of grated Parmesan. To drink? Weingut Friedrich Becker Blauer Spätburgunder Tafelwein 1997 from Germany’s Rhein is Pinot Noir to you and me. Unfortunately I can’t find my notes about why I selected this wine on a trip years back exploring German Pinot potential. 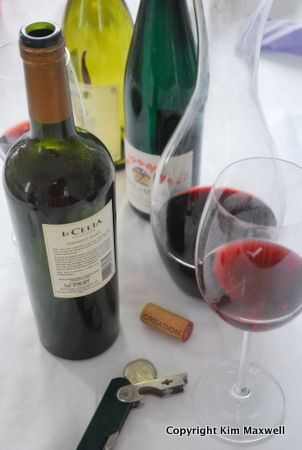 I found a reference online to a fantastic 2007 vintage of the same wine, so perhaps mine was a wetter vintage. With 13.5% alcohol and a dark colour, I found dusty wet tea leaf flavours and couldn’t appreciate much beyond a green character. Creation Pinot Noir 2013 from the Upper Hemel en Aarde showed riper raspberry and cranberry fruit and delicate tannins, as you’d expect for a younger vintage. Pleasant enough at 14%, but missing a little complexity in the mid-palate. Last up, 2001 vintage of Finca La Celia Reserva Cabernet Franc from Mendoza. Argentineans love their beef and specialise in powerful Malbecs. They actually makes decent Bordeaux blends too, so I was tempted to see how Cab Franc fared as a single variety with steak. Not too well it appears, or perhaps this wine just didn’t have the legs to age so long. We all thought we tasted too much oak sweetness and found the wine lacking a geographical stamp of identity. Pity. The outcome? At lunch the mushrooms reigned, as did the German Riesling. Argentina didn’t really feature in terms of wine. That wasn’t quite the case in the football game hours later where the teams were fairly evenly matched, but it ended similarly with Germany’s triumph over Argentina.